Meet Michelle, our magnificent supporter! 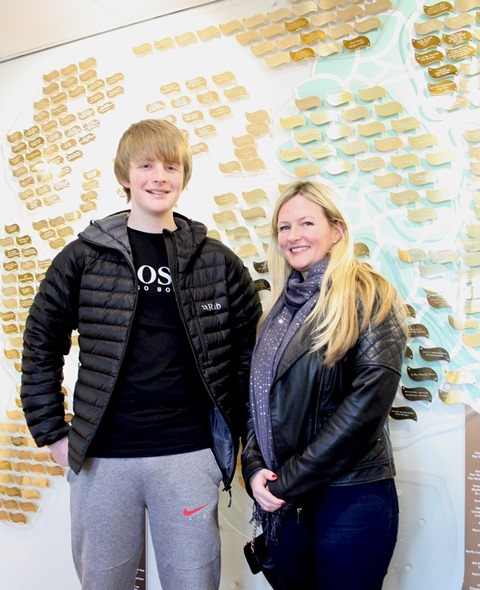 It was lovely to catch up with Michelle Moss and her son Kieran when they paid a visit to the Hospice on Friday. Michelle has been a warm supporter of Woodlands Hospice since experiencing our services and care first hand when her dear Dad was cared for in the Hospice. Since then Michelle, along with her work colleagues at Arvato, has raised money through raffles, cake sales and many other activities. Michelle and her sons have also distributed leaflets for our events in and around Crosby. Christine Peach, Corporate and Community Fundraiser at Woodlands, said: "We are thrilled to have this fabulous family support and want to thank Michelle and her family for all that they do for us. We would like to wish Michelle the best of luck for her next challenge event too." Our lovely picture above shows Michelle and Kieran standing by the engraved leaf for her Dad on our Tree of Life. If you need help with your fundraising ideas or your company would like to support Woodlands Hospice please email Christine or call on 0151 529 8117. If you would like more information about how to have an engraved leaf on our Tree of Life please email Carole or call on 0151 529 4143.